Stone Floors come in many different types including Indian stone, Sandstone, Granite and generic stone floor tiles. These types of stone floors can be very difficult to maintain and keep clean. We provide the cleaning of stone floors in Cheshire. This is carried out using specialist machinary which in most cases will make your floor look like new again. 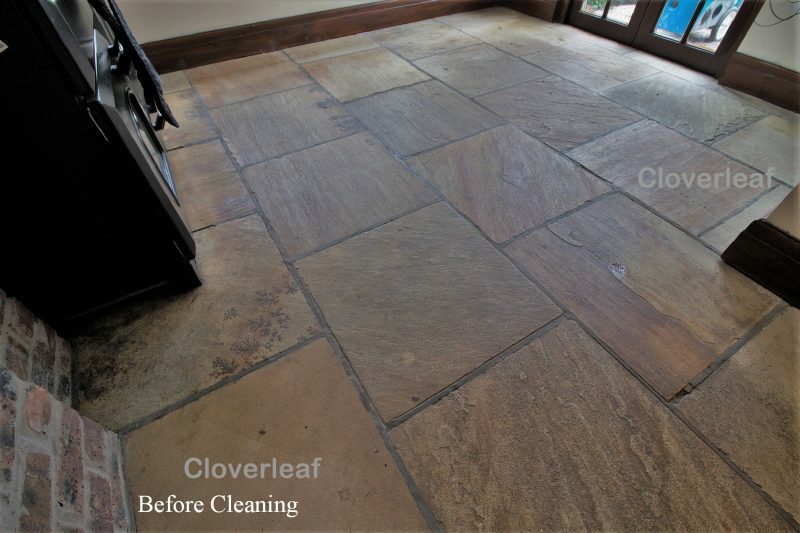 Get in touch for a free no obligation quote to see how your stone floor can be cleaned and restored. 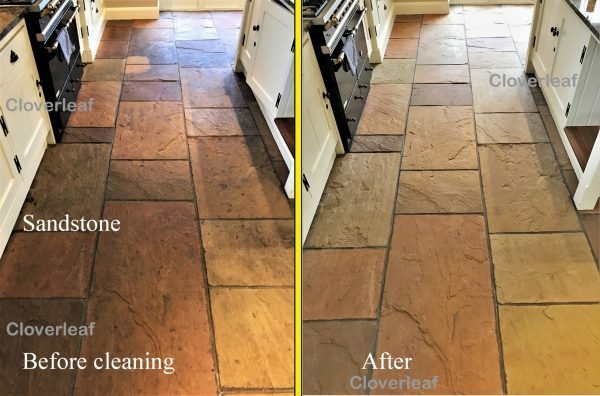 Services include: Sandstone floor cleaning, Indian stone floor cleaning, York Stone floor cleaning, stone floor tile cleaning and Granite stone floor cleaning. 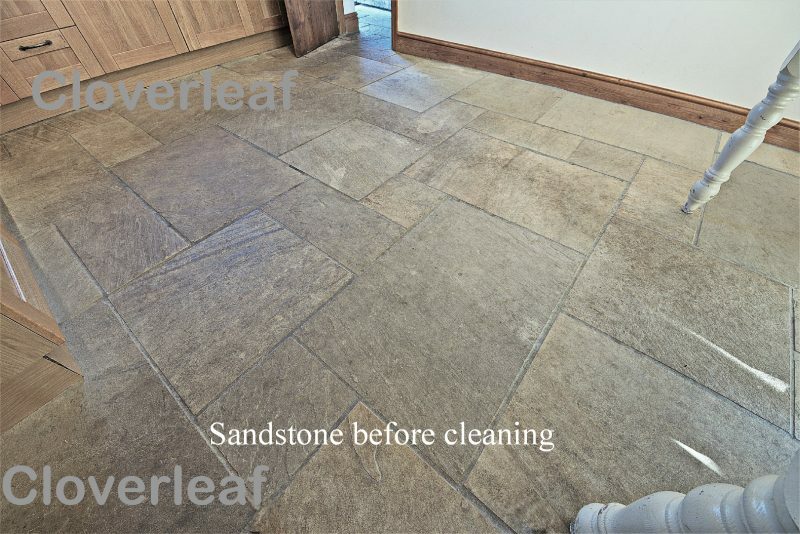 Areas covered for Stone floor cleaning in Cheshire include: Alderley Edge, Altrincham, Congleton, Chester, Crewe, Nantwich, Frodsham, Hale, Holmes Chapel, Knutsford, Lymm, Middlewich, Northwich, Sandbach, Tarporley, Winsford, Warrington and Wilmslow. 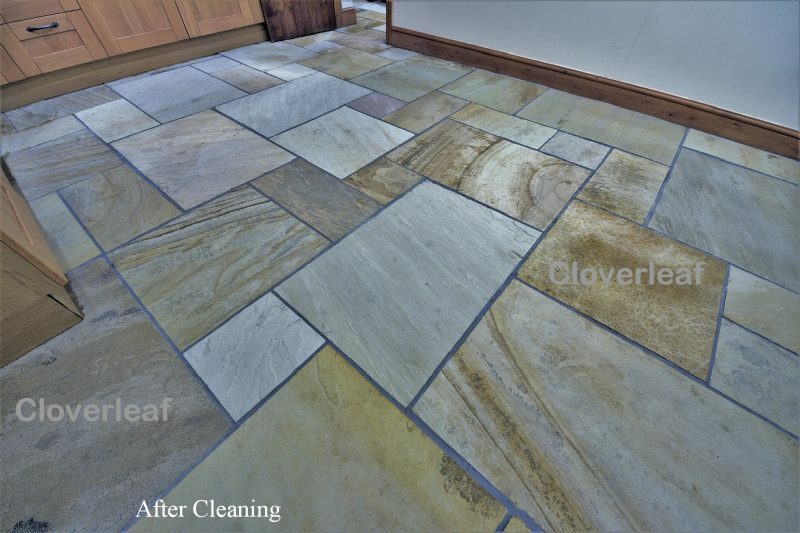 Indian Stone floor cleaning in Cheshire. Oposite is a typical example of a heavily soiled Indian stone floor which required cleaning. The floor was stripped clean and a seal applied to prevent stains and dirt being absorbed into the stone. 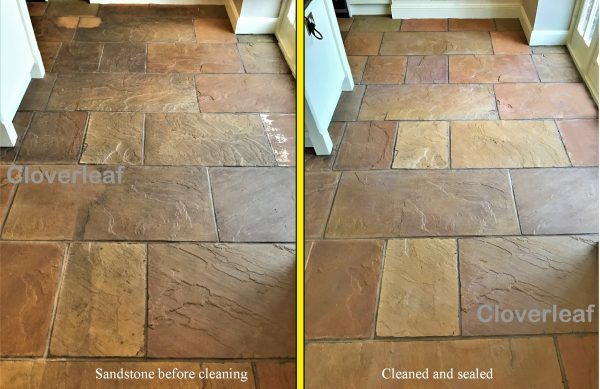 When sealed this type of stone floor is also much easier to clean and maintain. Sandstone floor cleaning in Cheshire. Another example of a stone floor which required cleaning in Cheshire. Sandstone floors also can have the name of Indian stone. There are many types and colour variations of Sandstone. This floor was also sealed to prevent stains being absorbed into the stone tiles. Granite floor cleaning in Cheshire. The pictures opposite are of a Granite floor in Altrincham which was in a poor state and had been down for many years. The floor was stripped clean revealing the lovely colours of the floor. This floor in particular did not require sealing. Granite floor tiles come in many colours and variations. Below is a selection of some of the different types. This Sandstone floor was quite heavily soiled. The floor was stripped clean and sealed with an impregnating sealer. Another happy customer. This was part of a very heavily soiled York Stone floor extending into a lounge, kitchen and a dining area. As can be seen, the York Stone floor once cleaned looks as good as the day it was laid. 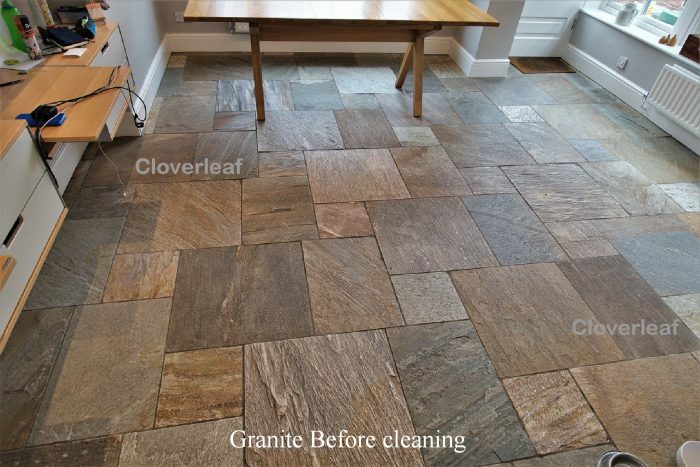 There is another page dedicated to slate stone cleaning. How do I get a quotation for my stone floor? You can call one of the numbers on the contact page and also the mobile number 07764254898 for a quicker response. If you are met with voice-mail just leave your number and you will be called back as soon as possible. You can also use the call back request or email address on the contact page. It is necessary to see the floor and asses your requirements, so a visit to your property or home is required and we can leave you with a quotation for your consideration. How long will it take to clean and seal my stone Floor? 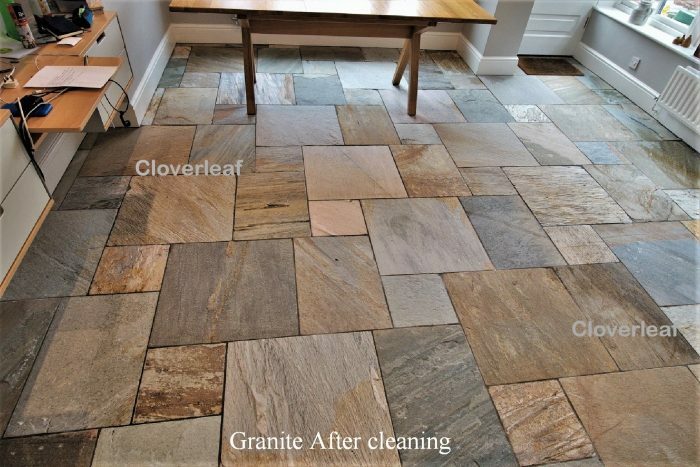 Most stone floors can be cleaned and sealed in one day. Larger floors may take two days to complete the work. The floor is normally ready to use at the end of the day. What is the best way of sealing my stone floor and does it really require sealing. Many types of stone can be absorbent. If left un-sealed, not only will they absorb dirt but will also could be susceptible to permanent staining. Additionally an un-sealed floor will be difficult to clean, subject to dust flaking and also unsightly once the original seal has worn off. 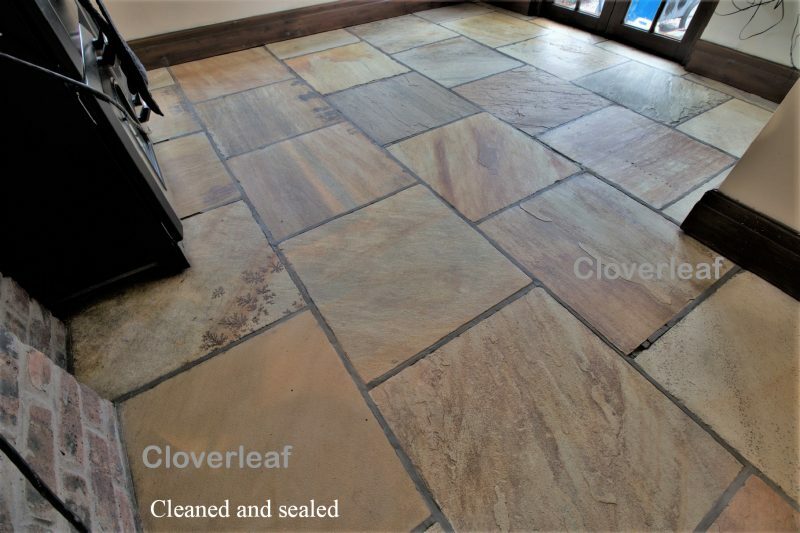 There are many types of floor seals for stone on the market today including those supplied off the shelf from DIY shops and also supplied from commercial suppliers. We only use commercial high grade polymer sealers or impregnating sealers that are durable and have a long life expectancy. A visit to your home will determine if your floor requires sealing. Some types of floor such as Granite are very hard and resiliant to staining and may not require sealing. How long will my floor last before it needs cleaning and sealing again? This depends on the environment and the amount of traffic to the floor. Most suppliers of floor seals indicate that their floor seals usually last around three years. However in our experience and the work carried out over the years in re visiting previous jobs we find that many floors once cleaned and sealed can last seven to ten years if good housekeeping is carried out. We also advise that good cotton entrance mats are used on entrances such as Turtle Mats that absorb moisture and incoming grit. Use a cotton entrance mat to help maintain your floor. Will my stone floor be easy to clean once it is cleaned and sealed? And how do I maintain it? This depends on the finish of the floor. An uneven surface can be difficult to mop clean as the mop cannot clean out the irregularities of the surface. On some types of floor it is possible to apply a polymer floor seal which will help prevent dirt sticking to the floor. This type of seal will leave a slightly reflective sheen which can be attractive and enhance the colours of the floor. The floor can also be cleaned at regular intervals with an outside polypropelene bristle brush by mopping the floor liberally with cleaning solution from a bucket and brushing over the surface to remove embedded dirt inside the grooves and hollows of the floor.